"Ren Bu Kan" literally means: space where martial art is practiced. In Eindhoven you can practice the Japanese martial arts Kendo, Jodo and Iaido with dojo Ren Bu Kan.
Kendo stands for the path of the sword, Iaido for the path of sword pulling in response to an attack and Jodo for the path of the stick. For more information about practicing these martial arts in Eindhoven see the links at the top of the page. 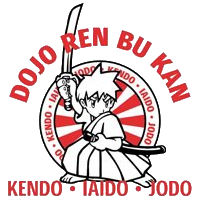 Ren Bu Kan is currently the only dojo in the south of the Netherlands where it is possible to practice these three martial arts. Ren Bu Kan is affiliated with the Dutch Kendo Renmei and the European Kendo Federation. If you are interested, you can come and have a look, free of obligation, and discover these fascinating martial arts. Attention! The lessons are cancelled Saturday 27 April 2019 at Ren Bu Kan Eindhoven!